Born in 1951, Jon Buck studied at Nottingham and Manchester Art Schools. He was a Fellow in Sculpture at Cheltenham College of Art and the first Artist in Residence for Thamesdown Borough Council in 1983. He is a Member of the Royal West of England Academy and a Fellow of the Royal Society of British Sculptors. Buck has completed many public commissions including ‘Embracing the Sea’ for Deal, Kent, ‘Returning to Embrace’ for Canary Wharf in London, ‘In the Swim’ for West Quay Centre, Southampton and 'Ship to Shore' for Portishead Quays. 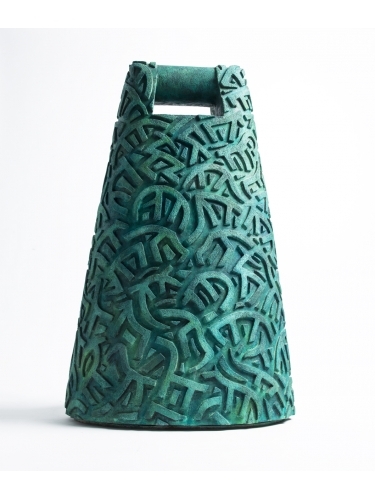 His work is regularly exhibited both in UK and abroad and is held in many public and private collections. From his earliest days Buck has pursued his own interests of the figure and the natural world. His recent work has become more iconic in form, centred on the ‘making’ processes of casting from clay and plaster into metal. Buck’s work has always been concerned with both human and animal forms and over time his figures have evolved from life studies to more iconic images reminiscent of goddesses and fertility symbols. In recent years drawing has played an increasing role in his work and lately the two activities of drawing and sculpture have become thoroughly intermeshed. The graphic elements are not only integral to the form but are also essential to the reading of the object. More sculpture, drawings and prints by Jon Buck are available - please contact the gallery.